Main Events staged their third NBC Fight Night card Friday night from the Sands Casino in Bethlehem. 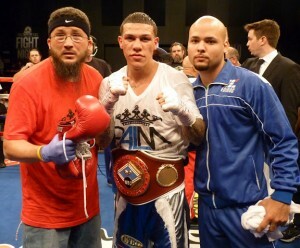 In the main event Jr. Middleweights Gabriel Rosado and Sechew Powell met for the WBO Intercontinental title. For seven rounds Gabriel Rosado and Sechew Powell engaged in a tactical chess match that had the makings of a disappointing fight. Then in the eighth round Rosado figured out his awkward southpaw opponent and forced a fight to break out. During the first seven rounds, Powell fought his fight from the outside in varying spurts, not allowing Rosado to use his pressure style and force an exchange of punches. Rosado constantly looked for openings, but seemed unsure of how to attack the crafty veteran. Powell has fought some of the best at 154lbs in his career and knows how to control a fight. Rosado would have brief moments where he went on the offensive, but for the most part could not push the action into his style of fight. Then in the eighth round everything changed. Rosado found his rhythm and was able to get in close where he could land his hooks and uppercuts. Rosado had Powell hurt, forcing him to save himself from knockdowns several times by grabbing the ropes. In round nine, Rosado resumed his offensive and this time got the result he was looking for. Powell was dropped for the first time in the fight after a series of uppercuts from Rosado. When the action continued, Rosado smelled blood in the water and went for the kill. He continued his uppercut and hook attack, landing multiple power shots that put Powell down and laying on the ropes. Referee Steve Smoger stepped in stopping the fight without a count at 2 minutes and 43 seconds of round number nine. It was an impressive turnaround for the rising contender, Rosado (20-5, 12 KO). He had to deal with a difficult style in the southpaw Powell (26-5, 15 KO) but showed he can make the adjustments needed to turn a fight around. Once he found a style that worked, he was aggressive in finishing his business. Rosado turned a bout that was far from fan friendly into an exciting bout that had fans thrilled in the blink of an eye. “It was kind of hard to make the adjustment at first (to a southpaw). I was loading up and I was missing big shots. Once I made the adjustment I was able to box and get into a rhythm. I was able to get on the inside and land the clean uppercuts and body shots. That’s when I stopped him. After his convincing performance, Rosado was very matter of fact in stating what he wants next. 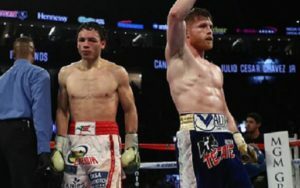 With rumors swirling that James Kirkland, who replaced Paul Williams, is out for the September fight with WBC Champ Saul “Canelo” Alvarez Rosado is ready to step in. Rosado now has two straight TV fights where he scored impressive stoppage wins on NBC Sports. The fighter who was once 14-5 is now a legitimate contender vying for a title shot. Rosado, who hails from Philadelphia and referred to himself as the true Rocky story, may have just put himself on the door step of getting his coveted title opportunity with the win tonight. In the co-headliner, in front of a packed sold-out Sands Casino arena in Bethlehem, hometown hero Ronald Cruz (17-0, 12 KO) outworked and out fought the slick Prenice Brewer (16-2-1, 6 KO) to the delight of the raucous crowd. 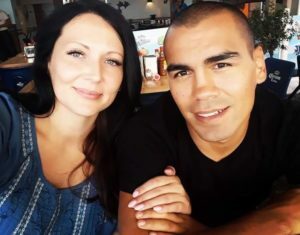 Cruz earned his first piece of hardware with the WBC Welterweight Continentals Americas title and gave the crowd the excitement they were looking for. He took the unanimous decision by scores of 118-110 on all three cards (the Boxing Tribune had it 117-111). The energy in the arena for the Cruz fight was electric. The moment Cruz began his ring entrance the crowd went into a frenzy. Each time Cruz landed a hard shot the entire crowd rose to their feet creating deafening noise. 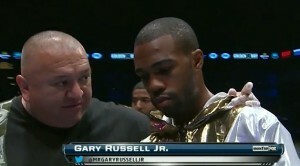 Going in, anyone following the fight knew this bout was clearly going to be a matchup of who could impose their style. Cruz wanted to push the fight in close and battle while Brewer wanted to box and move to avoid getting into exchanges with the heavier punching Cruz. For most of the fight ,Cruz was able to make it his fight. He stalked his opponent who seemed content to jab and move, but was unable to stop his determined foe. Cruz really began to make a dent in round four when he stunned Brewer for the first time with several hard shots. In round five Cruz had his opponent stunned again. It appeared Brewer could be ready to go, but he managed to survive despite an effort from Cruz to finish the fight. The same story played out in rounds seven and nine with Cruz having his opponent hurt and taking punishment. Brewer each time was able to move and jab just enough to avoid being put down. Cruz would land a heavy left hook and overhand right but each time Brewer survived. Brewer made a slight charge in round eleven with some flashy flurries and plenty of showboating, but really at this point was far behind on the scorecards and lacked the power to score a late knockout. Round twelve Cruz was again energized stepping on the gas to finish strong. It was a valuable learning experience for the young fighter, who had a short amateur background and in many ways is learning on the job. At times he thought he had his man. Cruz talked about his win, the regional belt he won, and fighting in front of an energized audience in his hometown. “This was the first step and it feels nice but this was the first step in going for that world title. Whenever my people think I’m ready, I’m ready. Trainer Indio Rodriguez and manager Jimmy Deoria commented as well on their charge’s performance. Cruz can now continue to progress and continue his fast learning curve. 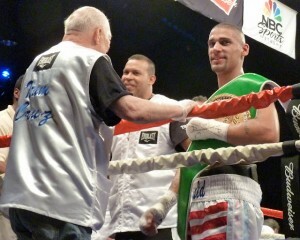 The Puerto Rican native and Bethlehem attraction will continue his rise and continue to build his growing fan base. 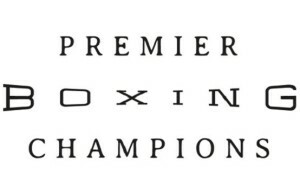 Hasan Young (1-0-1) of Philadelphia and Jerome Rodriguez of Allentown (0-0-1) fought to a majority draw in a thrilling four round light welterweight bout. Young controlled the first two and half rounds controlling the action and landing some hard shots. Then midway through the third Rodriguez showed his heart coming on despite being hurt. The southpaw Rodriguez landed a big left hand that changed the momentum. Rodriguez continued landing that left into the fourth hurting Young several times. Young showed heart as well by staying on his feet and battling back late in the fourth round. A draw seemed appropriate as both fighters had their moments. Scores were 39-37 for Young and 38-38 twice. Sergey Kovalev (18-0-1, 15 KO) of Russia, now fighting out of Ft. Lauderdale, FL, stopped Darnell Boone (19-19-3, 8 KO) of Youngstown, OH at 1:32 of round two. After a close first round, action got intense in the second round. The better fighter, Kovalev, began landing heavy shots and forced referee Steve Smoger to halt the action after a big right had Boone dazed and laying on the ropes. The short but exciting fight was in the light heavyweight division and was scheduled for eight. Anthony Irons (5-0-1, 2 KO) of Brooklyn, NY took a unanimous decision over Rafael Montalvo (2-2, 2 KO) of St. Clair, PA by scores of 58-56 on all three cards in a six round welterweight bout. Action was slow in the first four rounds as Irons circled the ring jabbing while Montalvo did little more than follow his opponent looking for one big punch. Action picked up in round five as Montalvo had a big round pushing Irons to the ropes to land heavy shots. The action continued with two sided battling in the final round. Montalvo tried to come on late but it was too little too late as Iron had built his lead piling up early rounds. In an uneventful heavyweight opener Eric Newell of Bethlehem and Tyaab Beale of Newark fought to a draw. Newell (4-1-1, 2 KO) and Beale (5-3-1, 1 KO) clinched most of the fight and rarely opened up throughout the four rounds. Scores were 39-37 Newell, 39-37 Beale, 38-38.